Epic Mickey was definitely not my favorite platformer game. I thought that the story was very uninspired and the levels certainly didn’t have a very good design to them. There just wasn’t too much to it but I figured that a sequel would help with all of that. Unfortunately I can’t say that this was the case as this game is still rather glitchy and has poor motion controls to back it up. It’s not a bad game but certainly not the most enjoyable one out there. The story starts with Mickey returning to Oswald’s world because something isn’t right. The Phantom Blot may have been destroyed but citizens of the kingdom are now being kidnapped. Moreover, someone has destroyed all of the warp gates in town so they are no longer accessible. If they don’t find the villain soon, then the whole world is at stake. Thing is, you never really feel that sense of urgency while playing the game. The heroes barely seem to care about what is happening so why should we? Even the citizens feel no sense of loyalty as one turns evil for no reason and the rest flock to be Mad Doctor since he has promised to help out from now on. The town just isn’t very smart and this makes it a little difficult to really want to save them. That brings me to the fact that this game’s cast of characters certainly isn’t great. Mickey is probably the most reasonable member of the group here as he does at least show some passion and nearly gets into a fight when one of the splatters looks at him the wrong way. Mickey wasn’t playing around in this game and also made the heroic call to not put the hostages at risk. Then we have Oswald…I’m not sure how heroic I can say this guy is. For starters he is one of the characters who believes that the Mad Doctor has turned over a new leaf. I can’t fault him for being optimistic and that is a heroic quality but it’s annoying because we then have to hear the villain sing constantly. What hurts him more is that Oswald quickly gets jealous when the townspeople start liking the Mad Doctor. He also encourages Mickey to finish the villain off at the end even at the expense of his friends/hostages. Granted, the hostages are robots but that’s an ethical debate that Oswald probably loses since they seem sentient and Mickey did want to save them. Oswald’s just not a very heroic guy at the end of the day. The gameplay is that of a 3D platformer where you run and jump to the goal. Typically you have to fulfill some kind of objective before making it to the end like destroying a machine or something of that nature. You have a paint brush which gives you access to two abilities, shooting normal paint and also shooting acid which really trips opponents up. It’s a handy ability to have but one that you will wish was not in the game since the motion controls make it a disaster. In general this is a perfect example of why I’m not really a fan of the motion era. It’s all just so rigid and not very intuitive. When you’re trying to aim at someone the brush will go crazy and you have to recalibrate your Wii sensor again. The objectives aren’t always straight forward either as you will wonder what needs to be done while you are going around blasting everything. The objectives on the map aren’t helpful either because it will show you the locations of the bonus missions but not for the main one. As a result expect to take a little longer than expected to beat the game. The game did do a pretty good job with the boss fights at least. The final boss is pretty theatrical and uses gameplay elements from the final Sonic DX boss (In Sonic mode) like the floor giving way and even mixing in a bit of Mario there as the floor becomes lava. These fights did take a little time to figure out how to fight the opponent but the Mystery wasn’t confusing and the characters would shout-out some clues which were actually helpful for a change. You also have to give the game credit for throwing in quite a lot of bonus content in the game. It’s story isnalreadybreasonably long at about 6 hours and with the bonus content you’ll probably be here for another 4-6. I can’t say that it is something even remotely tempting to me to be honest but it’s always a good option to have regardless as it prevents your game from being known as barebones. The graphics are reasonably good. The final big cutscene actually looks really good so I’m thinking that they spent the vast majority of their budget on this rather than on the whole game. I can understand the case for this since gameplay isn’t quite as important visually but getting it all to look smooth is important. The actual gameplay doesn’t even look as good as some N64 games. Forget the soundtrack as well since there really isn’t much there. There is a cliffhanger at the end which is either resolved in the extra content at the end of in a third game which will likely never come out. Ideally it’s the former I suppose. So the game did a lot of things wrong, but as I mentioned it at least had some positives to back it up as well like the boss fights. While the gameplay certainly wasn’t polished and made you feel like it was the true enemy at times, I do still generally like platformers like this one. 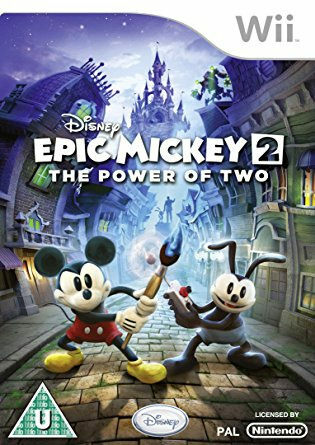 Overall, Epic Mickey 2 is not exactly game of the year material but it does try hard to be the big success that we all knew it could be. It just doesn’t pick up until the final boss of the game and was ultimately a missed opportunity. I’d probably still get the third game but I really wouldn’t have very high hopes for it. When you make the same mistakes twice, that is usually a bad sign. At least a sequel wouldn’t need to deal with the Wii motion controls. This entry was posted in 7 Star Games, Game Reviews, Games, Reviews and tagged Disney, Epic Mickey, Epic Mickey 2, Game Review, Nintendo, Nintendo Wii, Review, Sequel, Video Game Review, Wii by dreager1. Bookmark the permalink.